FairOak Fishery was opened as a business by the previous owner in 1991 and has operated successfully for over 20 years. It is a still water trout fishery which includes three attractive lakes, two large and one small. The lakes are fed with a constant flow of spring water rising in Fedw Wood which overlooks the fishery. Oak Lake, extending to approximately 1 acre (0.4 ha), a former Victorian lake, which was refurbished in 1990. The lake has depths of up to 20ft. Beech Lake, extending to approximately 0.9 acres (0.36 ha), an attractive lake with depths up to 15ft. Kingfisher Pool, a small pond which is used for beginners and children to learn to fish. 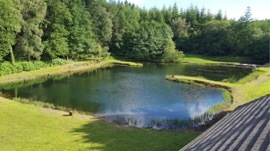 The lakes are stocked with a combination of rainbow and brown trout with a trickle stocking policy, utilising three holding tanks situated adjacent to the top lake. At present there is a natural stocking of brown trout up to 2.5lbs in weight. One of our rules is to have a limited amount of rod numbers around the lakes per day (maximum of ten.) This is for safety purposes and to ensure you have a good day fishing. Anglers must be permit holders to be allowed to fish at our fishery. Our smallest pool is used for practicing/ training for our novice anglers. Lessons can be organised if booked well in advance. Booking is strongly recommended as anglers who turn up on the day may be turned away due to being fully booked. The 2018 Season will start 1st March. For all enquires please call or email the fishery. We now offer accommodation in our 'Lake view lodge' for £45 a night or £65, which will include one three fish ticket. A kettle, tea, coffee, sugar, milk, mugs, TV and DVD player are provided. The fishery is situated just 2 miles from the village of Tintern but still lies in an area of outstanding natural beauty. Approximately 4.5 miles north of Chepstow and 12 miles south of Monmouth close to St. Arvans. Bristol 22 miles, Cardiff 36 miles, Gloucester 30 miles.